You might call them fruit flies, set out sticky-nectar traps in your kitchen to ensnare them, drown them, disgusted by their presence (here, in this intimate space). You might squash them with your palm, clap them to death as they swirl around you, too tiny to create any audible buzz, surrounded only by the sound of your death-claps rattling, rattling. Which, pardon, brings us back to bees again: how it was recently determined they can recognize zero, the concept of nothingness. Indeed, researchers set up an experiment that rewarded with sweet nectar or punished with a foul solution, and the bees chose nothing, consistently—could differentiate between the presence or absence of a thing completely. And this—this is something. Sitting on a stump of ponderosa pine, aseptic-smelling sap pouring out from gash-wounds along the side, watching fat honeybees circle and feed off of dwarf monkeyflower the color of plums or bruises, it’s so easy to say that since we can’t see bees’ thoughts, they must not think. It’s the human condition: to assume what we can’t see isn’t there. But it’s a fallacy, isn’t it? And we’re learning that every day. 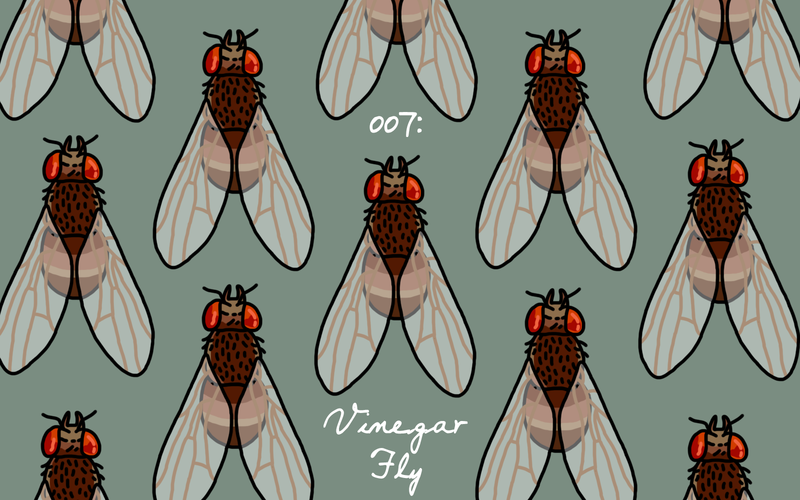 And the vinegar fly, well: we now know that they sleep, that they show periods of rest, unresponsive to the world and to one another. That they’re intelligent enough, regardless of the size of their brains (it’s a myth, you know, that size indicates intelligence) to recall long-term situations, to be trained by researchers, to remember. What is that, then? What is it that a fruit fly remembers? And then: What is it fruit flies dream of? With sleep, there’s dreamtime, right? Imagine. Every day we’re surrounded by the living world, creatures with invisible languages and interior realms imperceptible to us. Fruit flies remember; bees perceive absence. We don’t see these processes, yet, they’re happening, every day. There is complexity—you have to know—in everything we pass by, levels of consciousness we can’t yet comprehend. Not seeing doesn’t make it any less real. Not knowing something on an atomic level doesn’t mean we can’t feel it, appreciate what it offers—that there’s a whole inner world, everywhere and always. This goes against what we’re taught about the world and our place in it, makes us uncomfortable, makes us remember the legs we pulled off spiders and the bees we swatted and the mice we’ve snuffed out in traps. What’s the value in a thing that only lives for two months, anyway? This isn’t—it is not—any sort of creed or rallying cry. It’s simply, friends, a question: What if everything around us is capable of reasoning, some form of dreaming and being?